Going to the cinema is still one of those all time great experiences and a nice change of pace from the laptop viewing.. Sometimes you just want to relax and indulge in a wonderful film and even better if you can get a gust of culture at the same time. SERET London the Israeli Film and TV Festival can give you just that and they haven’t restricted the genre of the films being screened so you have the luxury in choosing all that you fancy. There are several festivals from a variety of countries around that world that present a cross section of subject matters but Seret is certainly one of the best. After all maybe its not so well known that TV shows like Hostages started out as Israeli programmes and like the danish and Swedish imports they have hit a nerve with British tastes. Unlike the Swedes and Danes, the reach for Israeli film and television is wide, varied and inclusive. “For our sixth Festival, we have stronger voices from women of all cultures and power bases; louder voices from Israeli Arabs and from Palestinians, all offering their own expression of the social and political multiplicity that the Middle East’s leading democracy represents, “ says the co-founders of the Festival Odelia Haroush, Patty Hochmann and Anat Koren. “This year’s programme is in equal measure thought-provoking, and entertaining. 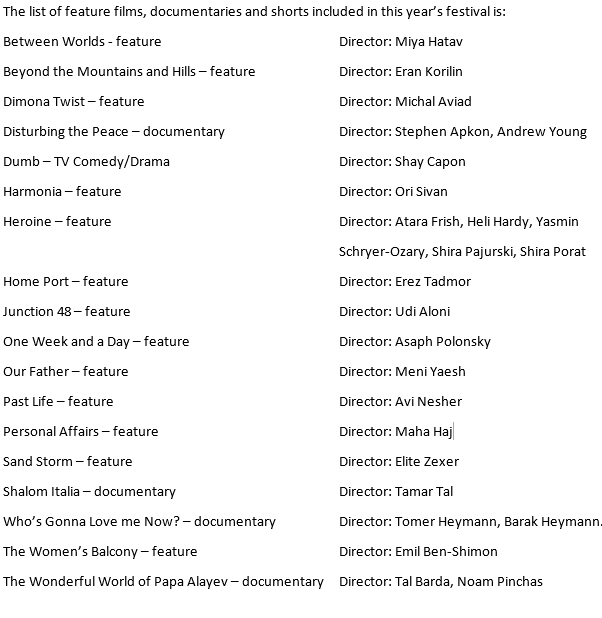 With such a vibrant line-up of films and documentaries created in Israel over the past year, many of which have been big winners on the national and international film award circuit, we’ve almost been spoilt for choice. For those film buffs, you also have the time to pick at the brilliant minds behind some of the films, as certain screenings will include Q&As with the actors and filmmakers. The cinemas chosen compliment the films, as the first screening will be at Soho’s spectacular Ham Yard Hotel on May the 11th. To open the festival a film described as brilliantly funny – The Women’s Balcony – shall fill the screen. Here is a complete list of every film being screened in all the locations - London, Redbridge, Richmond, Manchester. If you’re stumped for choice here are a few suggestions that will hopefully spark something for you. The Women’s Balcony will give you a bit of a giggle, and portrays women as strong and brave – as it should be. It starts when the women’s balcony collapses during a bar mitzvah, the new rabbi declares it’s because the women weren’t dressing with enough modesty. When the temporary synagogue opens, the women are shocked to find the new facilities don’t include a balcony for them. Junction 48 is a multi award-winning film that touches on society’s tough obstacles. 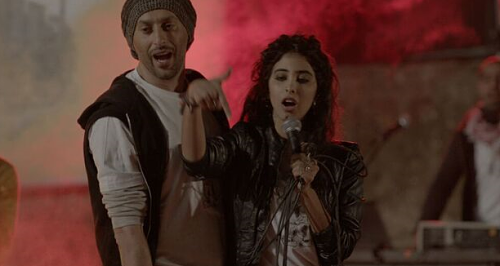 A Palestinian rapper Kareem and his singer girlfriend Manar struggle, love and make music in their crime-ridden ghetto and Tel Aviv’s hip-hop club scene. ‘Who’s Gonna Love Me Now?’ is a brilliant documentary that tells the story of a 39 year old ex-Israeli army paratrooper living in London who finds out he is HIV positive. He embarks on a journey of reconciliation, filmed over several years, with his religious family in Israel. Harmonia is continuing the strong feminist theme within the festival. The retelling of a biblical story, Sarah, the harpist of Jerusalem Philharmonic, is married to Abraham, its conductor. Childless, when Hagar joins the Western Jerusalem Orchestra the two women develop a unique friendship that is challenged when Hagar offers Sarah to have a baby for her, by Abraham. ‘Disturbing the Peace’ is a documentary that highlights arguments about culture and religion and presents them in an extraordinary way. It follows formerly diametrically opposed enemy combatants – aspirant Palestinian suicide bombers and Israeli soldiers from elite units – who have since joined forces to challenge the use of violence. A joint American-Israeli production, reveals their transformational journeys from soldiers and fighters committed to armed battle to non-violent peace activists, leading to the creation of the organisation Combatants for Peace. SERET truly is a festival for everyone, and a real opportunity to see the real Israel. It couldn’t have been done without the support and sponsorship of #BIGIDEA Israeli Summer Camp. They are an international tech sleep-away camp in Israel. For the past 10 summers, thousands of kids and teens have been in their safe and challenging environment that allows them to explore their creative thinking. Over a 2 weeks session, campers get a hands-on experience including technology, media arts, gaming and more, while also exploring Israeli innovation. Mix it up with fun outdoor activities, wave surfing and stage arts tracks. Dontan Tamir created eCamp in 2007 and later was the brain that created BIG IDEA. The idea formed after his experience in leading technological summer camps in the USA. Young people are allowed to choose their passion and take it to the next level: Movies or computers, DJ or Robotics or even Wave surfing. However, this is a completely different experience to school. It’s an opportunity that allows them to experiment and create in different workshops, while having the space to have fun. Not to mention their location is on the beautiful Mount Carmel, near Zichron Yaakov, just the right place for a perfect summer. Israel is well known for its innovation particularly in medicine and tech so it’s not surprising that there is a summer camp that encourages the very young to get truly hands on with technology from an early age.